Pre-heat grill pan or grill over medium-high heat. Pour two tablespoons vegetable oil into a small saucepan over medium heat. Add red onions and sauté for 3-5 minutes. Add vinegar and reduce by half, about 1-2 minutes, or longer, if necessary. Add brown sugar and cook one minute to incorporate. Whisk in broth and honey mustard, allspice and curry. Bring sauce to a bubble and reduce heat to lowest setting. Coat chicken with a drizzle of oil and salt and pepper, to your taste. 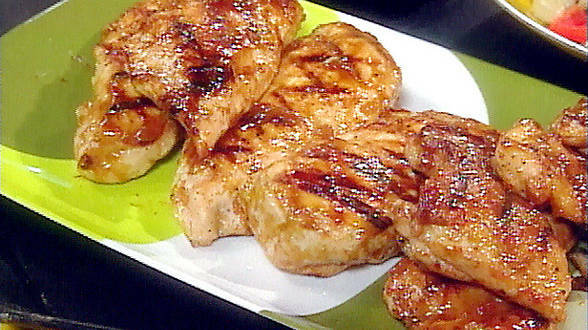 Place chicken on hot grill and cook 4-5 minutes, then turn. Baste chicken liberally with sauce and cook another 4-5 minutes. Turn once again and baste. Cook 2-3 minutes more to cook through. Transfer chicken to a platter and serve. In Recipes-list.com we have selected the most viewed recipes from category - uncategorized . Enjoy the best recipes specially selected for you! Honey-Mustard and Red Onion Barbecued Chicken is the right choice that will satisfy all your claims.